I know it's a little late, but as they say, "Better late than never." We have a board this month with, what else, but lots of hearts. It's a board for counting and recognizing numerals. The Pre-K teacher came up with this board. She made lots and lots of hearts and put them on the end of popsicle sticks. Then she made pockets with all the numerals on them. 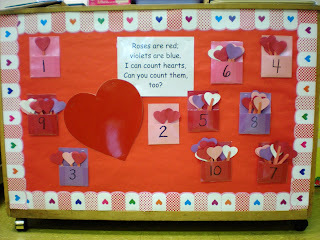 The children then put the number of hearts inside the correct pocket.